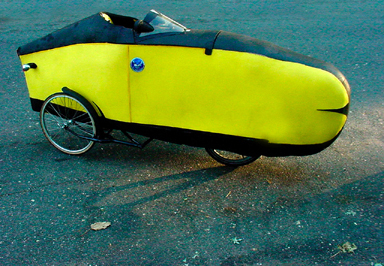 Chris & Tom Spollen's Wizzer Trike, built in July 2004, is now a velomobile. Three wheels changed the whole bike concept. Ford had four wheels with his Quadra Cycle. With three wheels you have a Vehicle. This is the computer-generated composite study that started us thinking and tinkering. Its original name was "The Rumbler," which was not the right feel of this machine. Its new name, "The Wizzer," came from the sound the front 3x7 internal hub makes when it feewheels, and with all new tires and new bearings, that's pretty often. Here's the finished product - practical transportation at 21 mph and better. This is where it all began years ago. John Tetz worked for ten solid hours at my studio, slowly heating and glueing up the early Zote foam fairing over a somewhat crude foam male plug of my creation. It endured years of abuse, wear and tear, and yet it still holds its form, and reappears once again on the HPV highway. 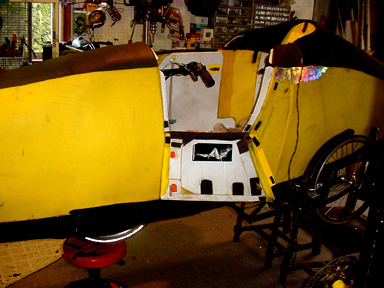 Here is the trike and the fairing inverted so we could see what we would be dealing with. The work begins. A lot of cleaning, glueing inside, replacing the bomb bay door hinges, scrubbing and rubbing. 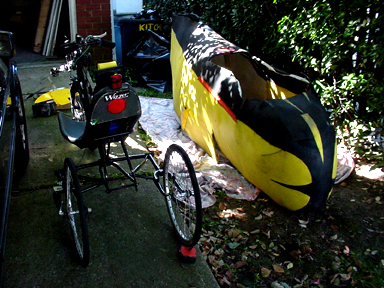 Great feeling just to see the old shell sitting on the new trike. Since this is a road machine, it must have signal lights and a headlight. 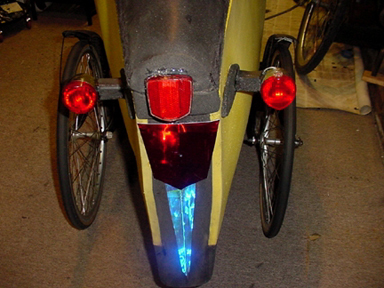 Note the recycled French Sobrite headlamp and slightly mismatched homemade bullet taillights. Tom saves everything, and over the years he has compiled boxes of sorted recycled parts, a treasure for the backyard builder. Tom came up with the plastic fender idea. I made the mounts out of scrap aluminum strips and side supports out of coat hanger wire. This shot of the inside of the fairing shows the simple dashboard. On a recent club ride, John Tetz said I was lazy for including a breaker box for a turn signal flicker light - too heavy and uses too much battery power. So now the driver just flicks the switch a couple of times. Push buttons would have been better, but I had done all the drilling and soldering. 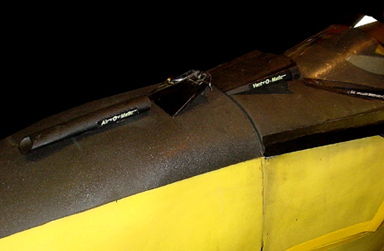 All wires are joined with a Western Union splice, soldered, and heat shrink wrap tube sealed. This is how the signal lights look from the rear. They are also very visible in daylight. The chrome plating is very shiny and reflects passive light well. 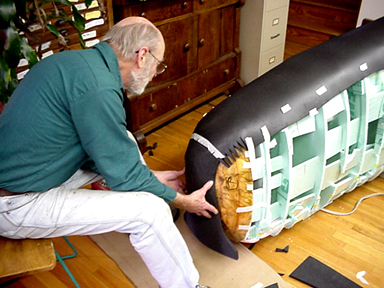 This is John's idea, a removable rear turtledeck for repair and servicing. The inside has room for a good-size trunk and a water bladder. Note in the bottom right a four-pack removable rechargeable battery pack which provides power for all onboard electric needs. Here are the vents and defrosters from the early days, a little hard to see. The first tube is called the Air-O-Matic; it, like the other two, fits in the windshield bottom cut-out. The Air-O-Matic forces air almost directly into the mouth of the rider, great on hot humid days. The other two are both defrosters that clear a small area of concdensation off the windshield bottom on damp or foggy days. A minimum speed of 19.5 mph is required for all of the above vents to work. No problem. 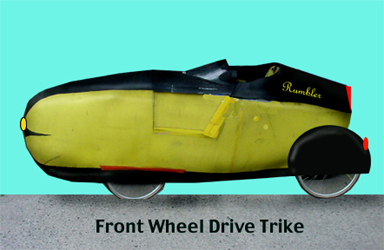 After running the trike for several months problem-free, we hit a snag after several fully-faired runs. In all three rollovers there was no damage to rear lights, machine, or rider. Three rollovers in a row, and we could not pinpoint the problem. We thought it was the tire breaking loose from the fork. After removing the fairing and upon closer examination by us and Eddie, our new team member who is a neighbor across the street, we discovered a fine crack in the right side braze that was throwing the trike into a lean and rollover. Eddie stepped in when we were stumped and directed us how to bend back the now-bent frame with a six-foot steel bar used in breaking up concrete. The machine was leveled under his careful watch, and a solution was at hand. "Torsion bar," he shouted, "that's what we need to increase the side-to-side strength." Tom and I just stepped back. He was right, so a call went out to Tom to find the steel needed to solve this problem. A handlebar was bent and formed to follow the shape of our design. Eddie used a tube bender to make the bends. He directed me where to make the various brazes. It looks aesthetically pleasing, as well as being the perfect width. Amazingly, this entire operation took about three hours of fever-pitched work. Here is Tom standing next to the now-completed faired street-ready Wizzer. I have been riding a streamliner in one form or another now for the past six years, in both hot and cold weather, sun glare and side winds, street riding in traffic alongside buses, and dealing with stop-and-go and cars changing lanes. The current Vee-Bee design is the best speed machine for this, topping out at a good 24 mph, and with a slight push I can go 27 mph. 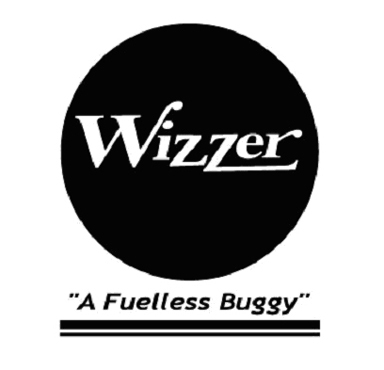 What is important with the Wizzer, however, is its three wheels and the stability they provide. The rider does not have to uncleat at a light, and can instead sit and look around. In the two-wheeled streamliner, de-cleating, pushing the bomb bay doors open, and re-cleating on take-off is far too hectic and not very relaxing. I have no problem trading off a little speed for a more relaxed and enjoyable ride.